The Buccaneers were mere inches away from completing one of the wildest game-ending plays in NFL history. With no timeouts remaining and a five-point deficit, Jameis Winston had to march down the field and score a touchdown in just over a minute. With seven seconds left in the game on Atlanta’s 21-yard line, Winston called his own number and ran up the middle. As he was about to get tackled, the quarterback threw a last-ditch backwards pitch in the hopes that a teammate would recover it. 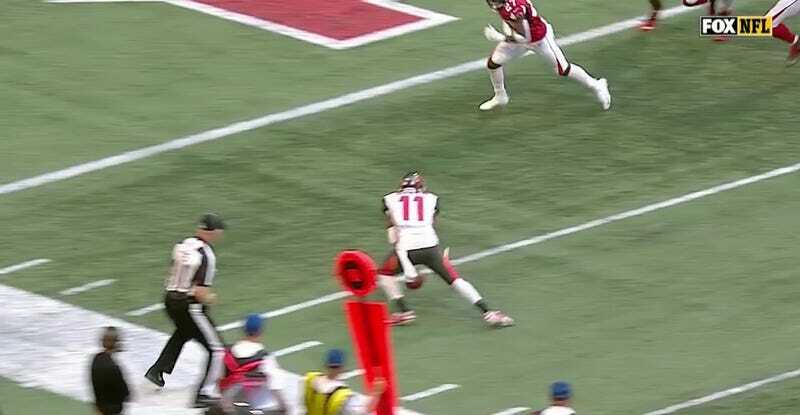 After some bobbling, Mike Evans got a handle on the ball, tossed it to an open DeSean Jackson with a lane to the end zone and, well, this happened. It makes sense why Jackson was so irate after the ball went out of bounds. All he had to do to be the hero was cleanly field the ball with five yards of space ahead of him. Instead, he got nutmegged and the game ended. It’s obviously not like this mistake was entirely on Jackson, as Evans’s toss wasn’t exactly moving cleanly through the air. Even then, that came after Evans corralled a poor Winston toss that didn’t seem to have any particular target. If it’s any consolation to Bucs fans, there’s no guarantee he would have taken the ball into the end zone in the first place. Jackson’s history is less than ideal in those scenarios.